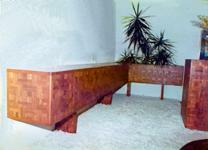 Michael Childs - artist, custom woodworking, writer, California. I've been making objects out of wood for over 60 years, starting with a little model airplane I built when I was 5 or so. By the time I was 12, I was building airplanes bigger than myself, boats, cars and rockets. In '60, I set about restoring an old style 24' power boat with an antique 2 cylinder engine, then progressed to a 33' that I lived aboard in New York City. Try that in the winter. In '70, in anticipation of a baby, I bought some woodworking equipment and built a cradle from plans, which she quickly outgrew, as well as designing and building the fixtures for a Meher Baba bookstore in Pasadena, CA. After the earthquake of '71, we moved to Myrtle Beach, S.C. where I had been invited to run a printing press for a startup company run by a friend whom I had met in NYC (I had learned how to run printing presses to support myself when I was studying music). The job fell through in a few months but not before I fired up another skill I had picked up along the way: guitar teaching. Within a few months, I had more students than I had ever had in either NYC or Pasadena, my most famous of which is Vanna White. By the time summer rolled around, all my students had disappeared into tourism businesses leaving me without any income. In the interim, I had been commissioned to design and build a large display cabinet for the neighboring Meher Baba Center. This project led to more commissions. Before I knew it, I was building tables for a clothing store, pews for Episcopalians, a cross for the Baptists, commercial fixtures and interiors for an interior designer, antique dealers who needed pieces to be tweaked before putting them on sale, or completely taken apart and reglued, and tons of furniture repair, refinishing, as well as designing and building custom pieces and interiors. 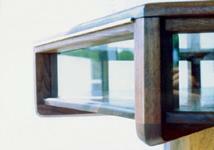 Display Case for the Meher Spiritual Center, Missouri black walnut. Commissioned by 2 architects for a Baptist church in a nearby town. It was hollow to accommodate lights. 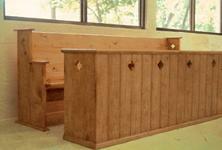 The main Episcopalian church needed a pew to match its others, but a custom length. 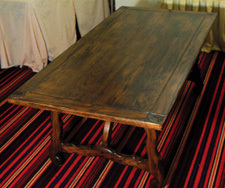 My friend Jane wanted a Spanish style table in black oak, I carved her favorite flowers, gardenias, in the corners. Including an 11' credenza whose entire front is a series of nearly invisible doors. 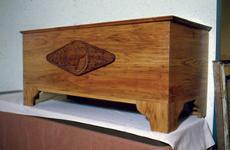 This chest was commissioned by a couple who ordered several major pieces. 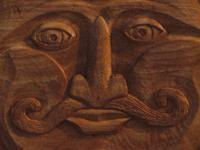 Made of rare wormy chestnut, the carving is two entwined roses. 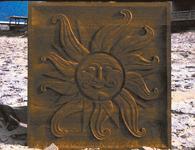 A client showed me a tiny snapshot of a sun effigy from Mexico. Could I make him one larger, say 3' square? Sure, as long as the Sun was a happy Sun.